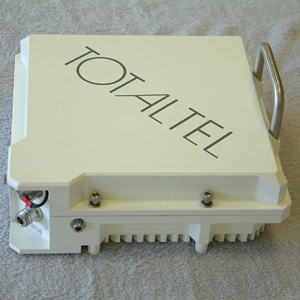 Totaltel installed the first TDR digital microwave radio in 1992. Among the first customers were the Postabank (Post bank) and the Antenna Hungaria TV and radio broadcasting company. 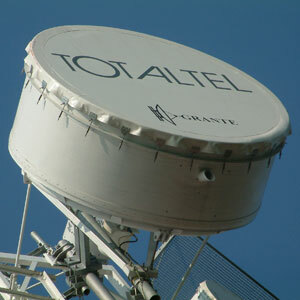 Totaltel supplied hundreds of microwave links to Motorola Hungary between 1996 and 1997. These links were installed in the network of MATAV, the Hungarian national telephone (POTS provider) company (its name changed to T-com). Some of those links were still in use in the year 2010. 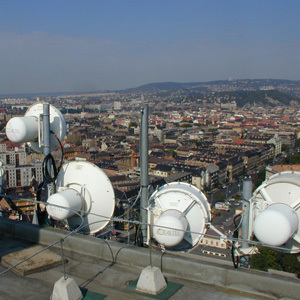 Totaltel microwave radios were installed for Paks Nuclear Power Plant, MTI - the national news agency, Upper-Tisza Regional Environmental and Water Managemant Directorate, Taxation Authorities (APEH), Hungarian National Railways, the campus networks of several universities in Budapest and for several private companies, e.g. Water Works of Budapest, Sara Lee Hungary, EGIS Pharmaceutical Company. 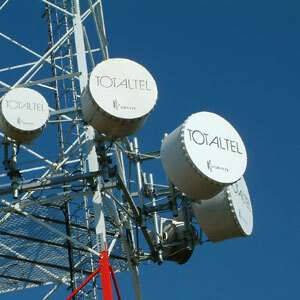 Totaltel supplied the microwave radios for the nation-wide network of the Hungarian Defense Forces. Based on the experience of the last 15 years engineers of Totaltel have developed an advanced version of the TDR microwave radio, the TDR-F "software defined" radio family. Members of the software defined radio equipment family operate in the 5-7-8-13-15-18-23-38 GHz frequency bands and provide the transmission of E1, E3 signals (2 or 34 Mbps, G.703) as well as link between Ethernet LANs (10/100Base-T). The equipment TDR-F consists of an outdoor microwave unit (ODU) and an indoor signal processing unit (IDU), interconnected by a single coaxial cable. The ODU is only dependent on the frequency band applied, while the IDU is only determined by the transmitted signals and some application conditions, like the protection system as well as the network management system. In the ODU wideband microwave circuitry is employed, the channel frequency and transmit power are adjustable by software. Flexibly configuring the equipment by the local craft terminal and replacing the interface units according to the actual demand, the modulation format (4QAM, 16QAM or 32QAM) and the transmission capacity (from 4Mbps up to 100Mbps full duplex) may be varied. Hardware versions of the IDU provide operation under various network management and protection systems: 1+1 protection may work in hot standby, space diversity or frequency diversity modes. IFE3: an interface for an E3 (34Mbps G.703) channel and a separate E1 channel. There are 4 interface slots available in the IDU. The capacity of a link with a given interface configuration can be modified via the management software. Interface channels can be set active according to actual demand. For example an IFE1 type interface can remotely configured to transmit either 2xE1, or 4xE1 or 8xE1 channels. An equipment with two IFE1 interfaces can also transmit 16 separate E1 channels. If an extra IFET interface is used in one slot, seamless changeover from E1 channels to Ethernet transmission is possible. The main parameters of the equipment comply with the relevant ITU-T, ITU-R and ETSI recommendations. This family of high data rate point-to-point transmission equipments operate in the 13..38GHz communication bands. Their transmission rate may be varied between 22 and 350 Mbps. They are suitable for linking LANs as Ethernet bridges, additionally providing the transmission of 1..17 E1 channels. Over the range depending on the frequency band applied, they provide cost effective realisation of medium to high capacity links in public and private networks. The excellent transmission performance, considerable flexibility, ease of handling, low power consumption and high reliability make up the important equipment features. The indoor and outdoor equipment parts are interconnected by a coaxial cable of length up to 300 m. The outdoor equipment and the antenna may be integrated. The indoor part is mounted to a 19" rack of 1U height. The outdoor part is data-rate independent, and depends only on the frequency band of operation. Coverage of each frequency band is provided by a minimum number of outdoor equipment versions. The channel frequency and transmit power are software configured. The indoor unit is frequency band independent. By sharing the radio channel bandwidth among the gigabit and E1 interfaces of appropriate numbers, the built-in multiplexer provides the simultaneous transmission of the respective signals. Radio channel interfacing is provided by the configurable 4-256 QAM modem based on DSP, applying forward error correction and adaptive equalization as well. The adaptive modulation mode, if selected, adjusts the modulation scheme to correspond to the actual state of the radio channel, thus maximizing the transmission reliability. It is possible to assign QoS functions to the signals transmitted over the Gigabit Ethernet interfaces. Equipment and interface cQoS functionsharacteristics correspond to the relevant ITU recommendations as well as to the ETSI/IEEE standards. There are 2 additional interface slots available in the IDU. The capacity of a link with a given interface configuration can be modified via the management software. Interface channels can be set active according to actual demand. Equipment maintenance and supervisory functions are built in: order wire with selective call, test loopbacks for diagnostic purposes, continuous BER indication and registration of the transmission performance statistics. Control of the supervisory functions may take place by local PC or via SNMP from the network management centre. The design and production techniques applied result in excellent equipment reliability. This member of the TDR-F microwave software defined radio family operates in the 1.5GHz frequency band and transmits one E1 signal. The radio utilizes the favorable properties of the applied 1.5 GHz frequency band. Since low-loss cables are available, there is no need to divide the equipment to ODU and IDU, so all indoor unit (IDU) construction was applied. Beside the usual 23...60VDC power input, a 230VAC version of the equipment is available. A 1+1 protection equipment is available for this radio to provide reliable transmission in critical links, like the modulation signal lines of broadcasting transmitters. The radio has a fixed E1 interface and equipped with an EOW phone. The E1 signal can be transmitted in an 0.5MHz RF bandwidth with 32QAM modulation. If more bandwidth is available, the modulation mode can be remotely changed to 16QAM or 4QAM. Based on the choice of antennas offered by a partner company Totaltel supplies parabolic antennas for all the above frequency bands of sizes between 0.3m ... 2.4m diameters. The ODU may be integrated with the antenna to eliminate the waveguide loss and unnecessary costs. For protected applications the protection splitter can be mounted directly onto the antenna and the two ODUs directly on the splitter. In this way a compact and economic solution can be provided. The TDR-F digital microwave radio can be supplied with standard SNMP functionality operating on its own embedded IP network. 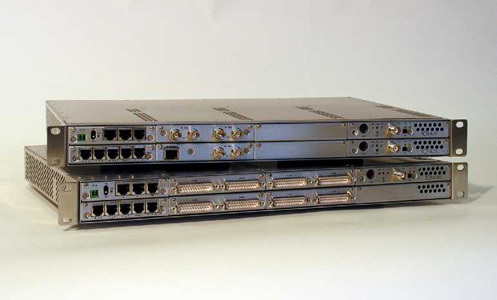 This network consists of a group of TDR-F equipments connected together for management purposes. Each microwave equipment has its unique IP address, each of them can be addressed and configured remotely from the OMC. Every parameter of the radio can be configured in this way. This separate Ethernet network created by the management system can also be used for other purposes: e.g. facility management. Moreover, if the microwave radio is equipped with the "external contacts" option card, it can relay control several external equipments like power supplies, intrusion alarm systems, air conditioner, etc. High quality OMC software can be supplied, which is able to control thousands of SNMP objects. In less demanding, cost-sensitive cases a proprietary network management solution can be provided.